John Pomfret has finally updated his blog, opining on a new global poll showing the Chinese, more than any other people on the planet, have the most profound “reality gap” between how they see their country compared to how the rest of the world sees it. To me this poll illustrates one of the most interesting aspects of the world’s interaction with China. That’s the gap between how most Chinese perceive of their country and how the rest of us do. Most Chinese people appear to believe deeply in the benevolent role that China’s plays around the globe. I saw this during the 10 years I lived in China. And I see it in the regular and friendly interaction I have with Chinese officials. It’s not surprising to see America in second place, of course. Anyone who spends a lot of time oversees (or even reads a lot of foreign magazines online) knows just how ugly America can look in the eyes of the world, in direct contradiction to our own perception of a benevolent, generous, often selfless friend to all the world. I got over this form of mild brainwashing when I was a teenager, and I often wonder why so many Chinese people find it next to impossible to even consider the possibility that their own image in the world is far different from their own perception. Pomfret attributes this gap to good old-fashioned propaganda, which not only glorifies China’s achievements and filters out bad news that the rest of the world sees, and also to racism, which makes all of us wary of this mysterious new rising power. In their ignorance, Pomfret says, many people simply dislike and distrust Asians. When asked about the behavior of Chinese tourists on overseas trips, Vice Foreign Minister Wu Dawei said he did not agree that the tourists had “backward habits” that “disgraced” the country. “Yes, it’s always Chinese who gather in big crowds and talk loud in airports and restaurants, but it’s just a habit. We Chinese are not used to the foreigners’ murmuring and whispering at a close distance either,” said Wu. I totally disagree with Vice Minister Wu. Little voices such as Yan’s can do little to shout down the triumphalism emerging from party central in Beijing. Yan’s comment is like spitting into a hurricane. It’s going to take a lot of time and deprogramming before most Chinese people realize their perception of China is not a universal one. And yes, that goes for America as well, though the smoke in our eyes isn’t nearly as thick. Readers know I approach Tibet cautiously, aware that it’s the most emotionally loaded of all topics (after the Nanjing massacre, Yasukuni Shrine, Tiananmen Square, Taiwan independence, etc. ), and knowing the situation there is not as black and white as some media in the West make it out to be. As Tibet enters its second half- century as an oppressed nation—this fall marks the sixtieth anniversary of the arrival of People’s Liberation Army troops in eastern Tibet—there is a sense that what happens there has implications for us all, not just in its environmental consequences, but in its political ones as well. How China deals with Tibet will affect its relations with Taiwan, and if Beijing does come to its senses and takes a more enlightened and farsighted approach to Tibet —as small a threat to it, population-wise, as Idaho might be to the US—it will inevitably win the respect of the larger world and do much to secure its own legacy. Part of the unusual fascination of the China–Tibet issue, after all, is that it seems to suggest a larger question beyond the geopolitical: How much can anyone live on bread alone, and to what extent does some sense of inner wealth either trump or at least make sense of all the material riches we might gain? It’s no surprise, perhaps, that 100,000 Han Chinese have already taken up the study of Tibetan Buddhism, and their numbers are rising quickly. The Dalai Lama has done his bit by announcing himself “semi-retired,” something like a “senior adviser,” in his own words; if Beijing thinks he is the cause of the recent disturbances and problems in Tibet, he has been effectively saying, he will gladly take himself out of the equation altogether to see if that can help. The Tibetans in Tibet have endured a lifetime of oppression with uncommon patience and fortitude. Now it remains only for China to be as “realistic” and transparent in its handling of Tibet as, the Dalai Lama noted, it was in the wake of the tragic earthquake in Sichuan last summer. His final words to the Chinese students, some of whom were sobbing and working Tibetan Buddhist rosaries as he spoke, were “Investigate, investigate. Analyze, analyze.” He left the Chinese professors with the words, “Keep out the propaganda. Keep out our Tibetan side, too, our emotions. Study the situation!” Two days later, however, as he was addressing the journalists in Tokyo’s Foreign Correspondents’ Club, another Tibetan man was imprisoned, for five years, according to Human Rights Watch. His crime? Daring to tell relatives abroad about what is happening inside Tibet. I remember one of the first times I heard of the Dalai Lama, back in the late 1980s when I was attending a pop “self-actualization” seminar on – pardon the Nietzschean title – the “power of the will.” The seminar leader told us how through sheer force of will, upon the invasion by evil and aggressive Chinese troops, the DL magically transported himself out of Tibet and landed, Star Trek-style, in the hills of India. And that’s how a lot of people in the West saw (and continue to see) him; not necessarily as a super-man, but as a mystical force, existing on a different and higher plane than us mortals. I no longer think of him as angelic or infallible, as a force of pure good at war with forces of pure evil. But I do think of him as more than a jackal, and of his followers as more than a clique. Again, there’s a middle ground somewhere. What I do know is that after reading Iyer’s piece, I have a deeper respect for the DL (and I admit, living here for a long time can distort your perceptions). This link is via ESWN, and I thank him for it. This was a pre-dinner quickie. Hope to elaborate when I get time. Much more to the article than I could comment on tonight. And no, I haven’t forgotten how the standard of living in Tibet rose after the “emancipation” and how much investment China has poured into Tibet. Two sides to every story. What will you be doing for Serf Emancipation Day? Update: Had to add this photo, via this excellent blog. 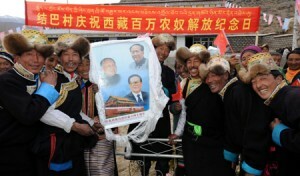 A totally spontaneous celebration by ethnic Tibetans unable to restrain their joy over the chance to participate in Serf Liberation Day and thank their gracious saviors. Saturday, March 28, China will observe a newly created holiday: Serf Emancipation Day, which commemorates the day in 1959 when the Tibetan government was dissolved after the Chinese government crushed a Tibetan uprising and the Dalai Lama went into exile. The holiday was established following last year’s Tibetan protests and riots against Chinese rule and is intended to highlight what Beijing says is the social and economic progress that Tibetans have made over the last 50 years. In conjunction, China’s state media has unleashed a propaganda blitz surrounding the holiday. Over the last twenty-four hours, headlines on state-run Xinhua news agency have included: “Ending serfdom in Tibet, a giant step in human rights progress that deserves commemoration,” “China calls on overseas Tibet report to be objective” and “Former female serfs recollect tragic past.” (None, however, quite reach the extremes of this report from a few of weeks ago: “A religious ceremony for the Dalai Lama used human blood, skulls and skin“). I’m reading in Peter Hessler’s River Town about how every time he turned on CCTV, they seemed to be featuring happy minority children performing folk dances, and how most of the time they were Tibetan. Always bouncing with joy and glee. The propaganda never stops, and it never improves. (At least Goebbels and Karl Rove did it with flair and imagination.) Whether or not China’s claims to Tibet are legitimate and whether or not things are better for most Tibetans now than they were pre-Liberation isn’t the point. The point is looking ridiculous in the eyes of the rest of the world for the scorched-earth, take-no-prisoners media blitz that everyone’s going to laugh at. Serf Emancipation Day. View from Shenzhen: What recession? I went through my first recession during my freshman year of college after 9/11. I remember the most tell-tale sign of the slowdown was that construction sites, ubiquitous in Florida, slowed or stopped entirely. I’m living in Shenzhen, China, now during an even bigger recession…. Except it’s not really a recession. China will likely be pulling 5-6% growth this year. While the IHT and other major papers carry a story a week about how bad the Pearl River Delta is doing, I just haven’t seen it. Everyone talks about things slowing down but few people are talking, or seeing, things closing up. Projects I saw started a year ago are finally begin to shape up as the scaffolding comes down and beautiful “gardens”, apartment complexes, emerge. New projects are breaking ground and cranes are almost as ubiquitous as they were three years ago. My best friend here – a Hakka man in his late-20’s who grew up able to eat meat just once a month – turned down a sales job paying, literally, 8x more than he makes now because he’s convinced his current one-man operation is going to explode any day now. As a foreign teacher I’m making more than I ever have. I’m making $35 an hour doing private lessons preparing a brilliant student to study in the US. I can treat a few friends to an exceptional dinner for half that. Four hours a week pays the rent for my 29th story apartment. My sister, a single mother who just got her Bachelor’s degree, is making $8. Enough for a Happy Meal and Big Mac dinner, perhaps. A final note is that it’s surprising how well China’s Maoist legacy acts as a safety net inside a capitalist economy. Shenzhen and cities like it, effectively, have half of their population living not as citizens, but as long-term temporary workers. Most of these workers who are getting downsized now will be returning to homes and farms in the countryside because they mostly were not allowed to sell. Most never made permanent residence because the archaic “hukou” household registration system ties delivery of government goods and services to those hometowns. If it works out well, they’ll be going back to a rent-free home with decent savings and severance to start their own projects, where their children have free education and increasingly subsidized health-care. As terrible as these policies looked during the boomtimes, they’re looking increasingly wise today. First, let me say I think this teacher is overly optimistic. When growth grinds down from years in the double digits to 5-6 percent, that’s an enormous shock to the economy, nothing short of a calamity. And whether he can see this or not in Shenzhen, it’s real and it’s painful. Often what we see in front of us can be deceptive. Just because people aren’t rending their garments in the street and lighting themselves on fire doesn’t mean there’s not misery aplenty. I own a home in America’s second most depressed housing market (after Las Vegas) and when I went back in November things looked just fine. I didn’t see a single person looking any less happy than in the good old days. But there were indications things weren’t quite right: for-sale signs on house after house, some of which have now been on the market for nearly two years. Lots of seats at the higher-end restaurants. Absurd discounts at the malls. The thinnest help-wanted section I ever saw (on-line and in the local paper). Even though there’s all that new construction and entrepreneurial enterprise going on in Shenzhen, that doesn’t mean there’s “not really a recession.” I have so many success stories to tell you from Beijing, some of which I’ve related on this blog, including my own easy search for a new job. Many people I know are making money, and some see this as a new golden age. Really. But I also know how some companies in recession-prone markets are doing, and it’s worse than disastrous. I have friends there, and they’re at their wit’s end. I did a lot of train travel over the past month and saw all the migrant workers sleeping outside of the stations waiting to go back to their hometowns. I’ve seen the half-finished buildings and the ghost malls. I’ve read some debates on whether the Chinese characters for “economic crisis” really mean “danger-opportunity” (my Chinese teacher insists it does, but I’ve seen the arguments disproving this, at least to the blogger’s satisfaction). No matter who’s right about it, this much is a fact: every crisis will mean an opportunity for somebody. Those lucky enough to get contracts from the government stimulus package, for example, will have a ball. But for many, this crisis is as real as can be. I won’t dissect this. I’ll just say I think this fellow means well, but his analysis is simplistic, failing to take into account certain realities, like the the tragic state of rural education here, the crushing poverty of most of China’s countryside and its notoriously inadequate health-care system. But I can understand why he’s feeling positive. There’s an optimistic, even euphoric mood in Beijing and Shanghai at the moment, and that’s probably the case in Shenzhen, too. A flurry of news headlines from all over the world seem to have created an impression that China’s stimulus plan is a winner, that it will pull out of the slump soon and even that the worst is over. China seems to be heading for a new leading role in the new world order. Or at least that’s the recent buzz. It’s at moments like this that I become especially cautious. I don’t think it’s time yet to uncork the Champagne. Like the grass mud horse, I wonder whether this is a bold political statement and a sneer at the censors, or just a giggly prank. See the explanation here. I just realized this past Saturday marked the seventh anniversary of this blog. This was my first inane post, written when I thought I’d be writing just for myself. If I’d only known what I was getting myself into…. To date, 4,715 separate posts and (gulp) 76,427 comments. (And I lost about 10,000 old comments when my site was ported over – badly – from Blogspot to MT back in the dark ages.) In case anyone was here from the beginning, thanks for sticking with it. What a ride. Inmates in China’s 2,700 pretrial detention centers suffer bullying and torture at the hands of fellow prisoners and police officers, and some experts want a neutral body to take the centers out of police control to curb the abuses, the state-run English-language newspaper, China Daily, reported on Tuesday. The newspaper noted that the Communist Party’s latest four-year plan for legal reforms does not contemplate changes in the detention system. The full-page article said that since February 8, five inmates had died under suspicious circumstances while in police custody. Amnesty International, the human-rights advocacy group, last week reported two additional deaths that the police say were due to illness. Family members dispute those explanations. Not sure what’s gotten into them, but this kind of serious reporting is certainly a turn for the better. Meanwhile, this despicable practice of allowing local police to run these detention centers should come to an end immediately. If China Daily is reporting it, I want to think it must mean the government is tired of it. Or did this somehow slip through the cracks, and we’ll hear tomorrow that the reporter got fired? Let’s hope this is the start of a trend. Real journalism in China. If it continues, the China’s media have an opportunity to end their image as puppets of the state. How far can it go? A few weeks ago a friend of mine with a sardonic wit and an acid tongue said we’d be better off if someone were to drop a neutron bomb on Shanghai, clear out the people and nuclear waste with a giant sponge and move in everybody from Beijing. Wait; no outrage – my friend was, I am fairly certain, joking. But as I saw this blog post with striking photos and very sharp commentary on the state of architorture architecture and city planning in “the new China,” and as I look out my window at Beijing’s singularly uninspiring skyline, I kept thinking about my friend’s remark. I don’t know about getting rid of the Shanghairen (seems somewhat draconian to me). But having just returned from a trip to Shanghai, I do know that I feel insanely jealous of Shanghai’s charming neighborhoods, ample colonial architecture and winding streets designed for walking, strolling, window shopping and enjoying life. As opposed to Beijing’s massive boulevards that can take literally 20 minutes to get across (ah, those fences) and are, aside from a few choice locations mainly along 2nd Ring Road, devoid of any semblance of charm, comfort, user-friendliness or humanity. …I am forced to wonder: Do I like these small streets and human-scale settings in Shanghai because I am foreign? Am I being like the French visitors who love Vietnam because it’s so easy to find baguettes there? Does the Chinese version of me really appreciate the huge grandeur of the Beijing-style approach? Or do I like them because I am human — and because something in human nature fits better with structures of a manageable size? And if this is so, what does it mean for the hundreds of millions of Chinese human beings living in these big concrete cities? I have to believe most Chinese people would agree Shanghai offers a kinder, gentler, more human experience than Beijing, at least in terms of ambience. I can’t believe anyone would look at Beijing’s streets and buildings and conclude this is what all cities should be like. That this is what society longs to be surrounded by. I just had a spectacular trip to Shanghai (and Guangzhou, for another post). While Beijing’s still my cup of tea, I do look with envy at how Shanghai managed to grow tastefully, with the human being in mind. I look at the concrete slabs that make up so much of Beijing and wonder how it could ever be reversed (it would take several stimulus packages to undo the damage). I know already that it’s too late. Maybe China can at least learn from the stark dichotomy as it continues developing, and remember that a city needs more than highways and buildings. It needs soul. I look at the new Chongqing, and I am skeptical the planners are getting this message. Luckily, Beijing makes up for the imbalance by having such a splendid population. But is there a law stipulating that a Chinese city can’t have both? I blogrolled these guys two weeks ago and have meant to call them out. This post on racism in China (if, of course, it exists at all) and how it compares with that elsewhere gives me special reason to do so. Note especially the delicious update and the excellent comments. This is a consistently excellent blog that impressed me from day one. Of course, this will mean I can’t sit at home and blog. Or use Facebook or Twitter or other time-wasters. There’s still lunch hour and after work. I’ll do the best I can. And thus begins yet another new phase in my life. Update: Looks like blogspot blogs are blocked in China yet again. That would be an infuriating nuisance. Update 2: For those working on their Chinese like me, please check out this post on the integration of Chinese Pod and the newest version of the Pleco dictionary. Pleco founder Mike Love explains how it works. I am a big fan of both, and I’ve discovered that Pleco flashcards really do work. I use them everyday when stuck in traffic and on the subway.